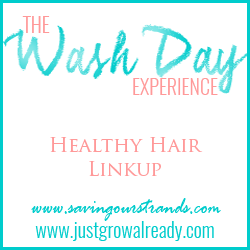 This week’s Wash Day Experience focus is on Detangling. Since I’ve already written exhaustively on the subject of detangling and I’m going to actually skip washing my hair this week in favor of getting a little extra life out of my loose two strand twists, I decided to pull together all of the articles I’ve written on detangling to date. Each of these articles makes up a complete resource of tips, photos, videos and step by step instructions on how to detangle your hair effectively but more importantly, safely. Having fine natural hair, one of the most critical things you need to do is detangle your hair safely. Otherwise, you will lose a lot of hair unnecessarily. Nobody wants that! Without further ado, here are the articles you will find on Fine Natural Hair and Faith that were written on the topic of detangling. I included a summary next to each so that you’ll know what to expect when you click that link 🙂 Plus, each link will open a new window so you won’t have to keep hitting the back button. I know. I’m so considerate LOL! NOTE: Some of these articles have images with “Radiant Brown Beauty” stamped on them. Not to worry. I still wrote them. Once upon a time ago, this blog was actually RadiantBrownBeauty (dot) com. Finger Detangling 101: The Fine Natural Hair Way – A guide on finger detangling and how to actually prevent tangles in the first place. Discover why finger detangling is a fine haired natural’s best choice for getting rid of tangles and snarls. Top 10 Detangling Tips for Length Retention – Ten tried and true trips for detangling your hair with the goal of retaining as much length as possible. Easy Peasy Detangling and Knot Removal – A video of detangling a knot in action…using one of my favorite natural hair products to detangle! Hair Steaming and Detangling with Glycerin – Another wash day experience post, this article is quite thorough on how to use glycerin to detangle your hair natural hair. It even includes a video discussing this fairly new (to me) regimen which also helps to impart additional moisture to parched strands. 2012 Pre-Poo and Finger Detangling Regimen – Shares my step by step regimen for detangling fine natural hair (well how I did it back in 2012. Still helpful and while the technique hasn’t changed, the products have…some). Previous PostDo You Have A Special Place for Me Time? I need to pick up some glycerin and add it to my regimen. I’m sure it will do wonders for my moisture loving hair. Love this comprehensive list chica!!! Detangling with glycerin as a pre-shampoo treatment has been a GOD send for my curls! I’m glad to see that it works for you too!